My new little chain is 3 inches long now after today’s work session. It took 33 links to get there; a side effect of the smaller links, given how they overlap in this pattern. To give you an idea of the scale, this picture includes a nice shiny example of the larger version I talked about yesterday, this current project, and a US quarter. 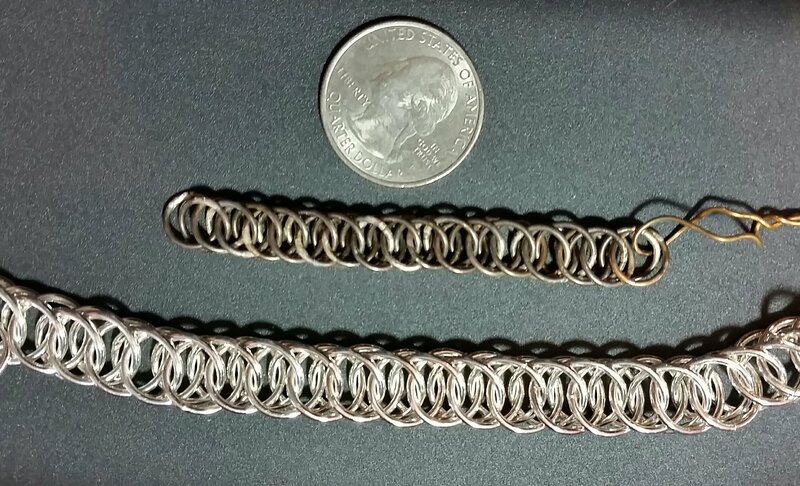 The larger chain links are 11.58 mm across. The smaller chain links are 8.5 mm across. With any luck, I’ll finish this tomorrow. Another 3 inches will make it fit a slender wrist, when the clasp is added.